Creative Instore Solutions is a leading global point of purchase design and merchandise company. For optimal return on retail space at point of sale, contact Creative Instore Solutions. Panasonic Energy Europe joined forces with Creative Instore Solutions (CIS) producing a gondola end category management solution to create an in store beacon for their energy products. The display unit to be featured in B&M, one of the fastest-growing discount retailers in the UK with over 400 stores, provided Panasonic the opportunity to showcase their product range. 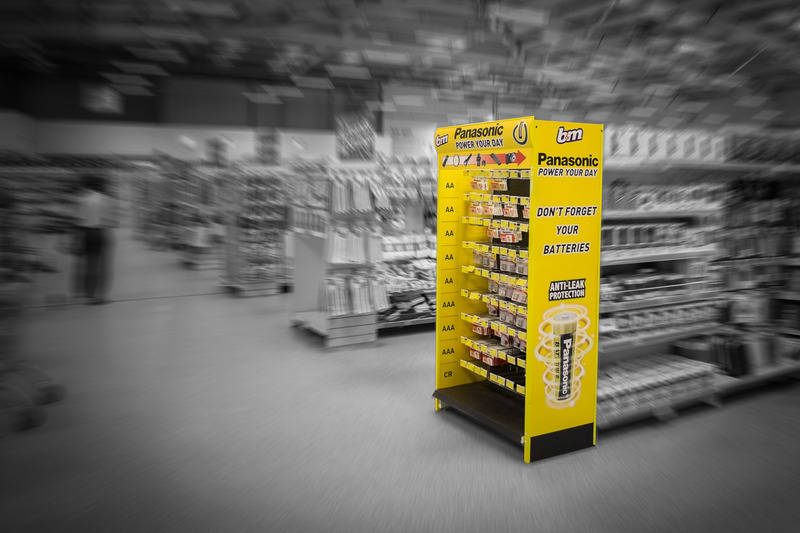 From the outset Panasonic had clear display requirements specifically around not only raising the profile of the battery category but also to ensure consumers were adequately educated in their product choices, all whilst helping the retailer to differentiate their store proposition. In line with the B&M aim of providing customers with a fun and exciting shopping experience, CIS produced a bold and informative category management solution to prompt shoppers to remember battery purchases showcasing great products at exceptional value. With a semi-permanent life expectancy, the initial roll out of the category management solution is clearly an in store success story with its high quality print and finishes. The unit communicates core brand messages to consumers including anti-leak protection whilst showcasing calls to action close to the till. CIS ensured a fresh look for gondola end display perfectly showcasing the vast array of Panasonic product giving the brand a clear in store brand identity. “We are excited to be collaborating with Panasonic Energy Europe who align with CIS brand values including our unwavering pursuit of customer focus and retailer value add “said Steve Howell, Creative Instore Solutions, Founder and Managing Director. “As a bespoke point of purchase display design and manufacturing company working with brands and retailers whose desire for innovation and ROI ensures retail harmony”. Established in 1995, Creative Instore Solutions is a global point of purchase design and manufacturing powerhouse that blends creativity with structural engineering to conceive sustainable designs which drive incremental sales. It’s an award winning combination that sees them work with a blue chip client base. CIS, whose head office is in Sydney, have offices in North America and Europe, managing a global network of design and logistics with manufacturing out of their China industrial centre. CIS’ client base includes PepsiCo, Smiths Snack Food Co, Mars, Schweppes, Woolworths, Microsoft, Lion Nathan, Pernod Ricard, Panasonic, Vodafone, Twinings Tea, Lenovo, Garmin, and Kraft. To date, CIS has won over 70 global and Australian industry Awards, including the Premier’s NSW Export Award, Professional and Business Services category 2013. This entry was posted in activation, Company, Design, point of purchase, point of sale, UK and tagged activation, Display, End cap, point of sale display. Bookmark the permalink. We can deliver the CIS blog directly to your inbox. One way to avoid being left with one tab of toilet paper in your moment of need #officetoilet #officelife #banta #momentofneed #JD!!! !